The parish cemetery, which lies alongside St. Anne Church at East Lehigh Avenue and Memphis Street in Philadelphia, includes graves from the mid-19th century. The parish was founded in 1845, mostly for the burgeoning community of ethnic Irish dock workers. 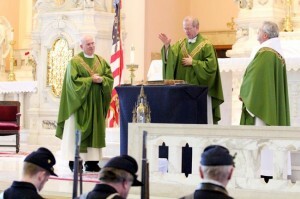 At left, Father Edward Brady, pastor of St. Anne Parish, watches as Father Thomas Higgins, dean of the Kensington area in which St. Anne’s is located, blesses Villanova University’s effort to digitize the parish’s records. Villanova’s president, Augustinian Father Peter M. Donohue, is at right for the signing of agreement. 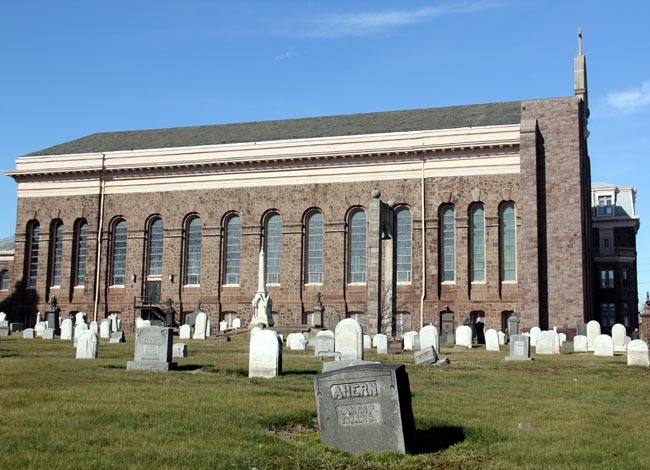 As cemeteries go, St. Anne Cemetery, which is adjacent to St. Anne Church, in the Port Richmond section of Philadelphia, is not large. Many if not most of the tombstones, weathered by a century and a half of winter and summer storms, have seen their inscriptions obliterated and lost to memory, save that of a dwindling number of descendants, and the written records of the grand old church. At St. Anne’s 10:30 a.m. Mass on Sunday, Feb. 10, an agreement between Villanova University and St. Anne Parish was formally signed by Augustinian Father Peter M. Donahue, president of Villanova University and Father Edward E. Brady, pastor of St. Anne, for the digitalization of the cemetery records and other parish material, in order that the records be preserved for all time and easily accessed through Villanova’s site on the Internet. Witnessing the signing and blessing of the document was Father Thomas Higgins, Dean of Deanery 12, which includes St. Anne. Father Higgins was also principal celebrant of the Mass and Father Donahue preached. A gifted homilist, Father Donahue nicely tied in the calling to service of Isaiah, Paul and Peter, as chronicled in the day’s readings, to the call to the founding members of the parish and also everyone who has come after. Also participating in the ceremony was a detachment of Civil War re-enactors representing the 69th Brigade, the famed “Irish Brigade” that was formed during the Civil War and served with distinction from Bull Run until Appomattox Courthouse. Although the Irish Brigade was mostly New Yorkers it did include the 116th Pennsylvania Regiment made up mostly of Philadelphia Irish, no doubt including parishioners from St. Anne. As a matter of fact scores of Civil War soldiers are buried in the old cemetery, ranging from casualties of the war to elderly veterans; their grave locations are impossible to determine except by the old maps and records. The contract was signed with Villanova University, because Villanova has emerged as the go-to place for preserving Philadelphia Catholic history, explained Ken Milano, a member of the historical committee assembled by Father Brady. The history is indeed fascinating. When St. Anne’s was founded in 1845 Philadelphia was just one year off the burning of St. Michael Church, then its nearest neighbor, by a Protestant mob during sectarian strife. Interestingly, historians regarded St. Patrick’s near Rittenhouse Square as the real mother parish for St. Anne. St. Patrick’s was near the Schuylkill River wharves where coal from upstate Pennsylvania arrived in Philadelphia, and most of the men who worked the wharves and coal yards were Irishmen and members of the parish. When the Philadelphia and Reading Railroad established a terminal in Port Richmond, The railroad became the main supplier of coal, linked to the Delaware River at Port Richmond. In the 19th century coal was not only the prime source for winter heating, it also supplied power year-round to virtually all the industry of the city. The Irish working men and their families left the Schuylkill wharves and St. Patrick Parish for Port Richmond and St. Anne’s was founded to serve them. The parish growth was phenomenal. By the 1890s they had one of the largest and most beautiful churches in the city. There were 12,000 Catholics in the parish and the real wealth of the Irish was their large families. According to the histories, the parish school had 900 girls taught by St. Joseph Sisters and 800 boys taught by Christian Brothers. (Girls outnumber boys because in that era working class boys left the parish school for employment earlier than girls). 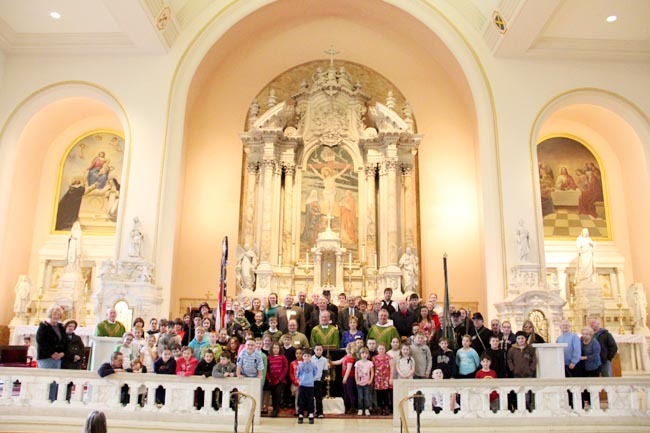 The parish averaged 400 baptisms per year during its first half-century. Times change. Today’s parish is multicultural, and most Catholics have left the area for the suburbs. Still the fine old church and cemetery remain as a testament to a faith that still exists in diminished numbers in Port Richmond. Parishioners of St. Anne Parish, in Philadelphia’s Kensington section, join as a community after the documents authorizing digitization of parish cemetery records are signed Feb. 10. This article was printed in 2013, it is now 2017. I have been searching for quite some time, but I have yet to see any digitized birth or marriage records from St. Anne’s online. If there is any way to access birth and marriage records from this parish? Is there an email address we can write to in order to submit document search requests? Any help would be appreciated. I contacted Villanova years ago with no luck. I am searching for my mothers roots. She was born on 3/12/1908 and was a member of ST. ANNE’S. Her maiden name was Carney. She had a brother and two sisters. I believe she must have lost her Father very young. Any help or suggestions would be greatly appreciated. My mother, Agnes Shields was born July 26, 1907. She grew up in the parish, not sure if she was born there. Her great uncle, Francis Shields died at the battle of Antietam, 1862, and is buried in the parish cemetery. I recently learned that last year the Knights of Columbus had a ceremony and laid a wreath on his grave and on the graves of 2 other Civil War deceased. If they are doing this again, I would love to attend,but do not know how to find out about this. I too am part of families, Coleman & McGee’s, my parents were born, raised and buried from St. Anne’s. No truer words were spoken, I am one of ten!! Thank you so much for this article, I cannot wait to sell my house and hopefully becaome a St. Anner again! My family are long time members of St.Anne, not founding members but shortly after it opened. my grandfather James Anthony McBride the first born in the USA in 1850 and the oldest of the children of Patrick and Grace Gallagher McBride. Family names include, McBride, Dougherty, Campbell, Fenerty, McCafferty, White, McNulty, McTamney, Carpenter, Lanahan. Most Baptised, Married and burried form St. Anne and the older members burried in St. Anne’s cemetery. Good Luck with the project cant wait to look at it online. I have been a fan of yours over the years. I guess you might retire on your 110th Birthday. The caption on the photograph is wrong calling it Kensington – two distinct suburban areas to the Olde City of Philadelphia. When I was a kid, if you called someone from “Port Richmond a Kensingtonian ; or vice versa, there were bound to be black eyes from the real “Fighting Irishman” who lived in two distinct areas. You should never get the areas confused. I’m from St Louis so what is the area called? My grandparents were married there in 1901. I hope to be able to see the beautiful church the week of Aug.6th.